This study sought to examine the effect of meditation experience on brain networks under- lying cognitive actions employed during contemplative practice. In a previous study, we proposed a basic model of naturalistic cognitive fluctuations that occur during the practice of focused attention meditation.This model specifies four intervals in a cognitive cycle: mind wandering (MW), awareness of MW, shifting of attention, and sustained attention. Using subjective input from experienced practitioners during meditation, we identified activity in salience network regions during awareness of MW and executive network regions during shifting and sustained attention. Brain regions associated with the default mode were active during MW. In the present study, we reasoned that repeated activation of attentional brain networks over years of practice may induce lasting functional connectivity changes within relevant circuits. To investigate this possibility, we created seeds representing the networks that were active during the four phases of the earlier study, and examined func- tional connectivity during the resting state in the same participants. Connectivity maps were then contrasted between participants with high vs. low meditation experience. Participants with more meditation experience exhibited increased connectivity within attentional networks, as well as between attentional regions and medial frontal regions. These neural relationships may be involved in the development of cognitive skills, such as maintaining attention and disengaging from distraction, that are often reported with meditation practice. Furthermore, because altered connectivity of brain regions in experienced meditators was observed in a non-meditative (resting) state, this may represent a transference of cognitive abilities “off the cushion” into daily life. The Laboratory of Neuro Imaging, which seeks to improve understanding of the brain in health and disease, is a leader in the development of advanced computational algorithms and scientific approaches for the comprehensive and quantitative mapping of brain structure and function. It is part of the UCLA Department of Neurology, which encompasses more than a dozen research, clinical and teaching programs. The department ranks in the top two among its peers nationwide in National Institutes of Health funding. For more information, see link. 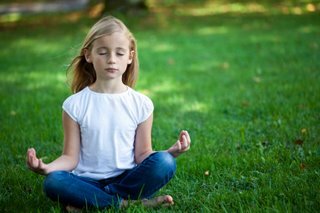 ”] Simple meditation techniques, backed up with modern scientific knowledge of the brain, are helping kids hard-wire themselves to be able to better pay attention and become kinder, says neuroscientist Richard Davidson.Davidson — who will speak Friday at the University of British Columbia on his new co-authored book, The Emotional Life of Your Brain— has put his research into practice at elementary schools in Madison, Wis.About 200 students at four elementary schools have used breathing techniques to hard-wire their brains to improve their ability to focus on their work. “It’s so widely popular and successful, the district wants us to scale it up the entire (Madison) school system,” Davidson said Wednesday in an interview. Davidson, who was inspired by a meeting with the Dalai Lama in 1992 to research areas like kindness and compassion, heads up several laboratories at the University of Wisconsin including the Center for Investigating Healthy Minds. Research, including brain imaging studies, also shows it is possible to cultivate the mind to change brain function and structure in ways that will promote higher levels of well-being and increased resilience, said Davidson. His research is outlined in dozens of articles in scientific journals. The techniques used with elementary schoolchildren are quite simple. To improve a child’s ability to pay attention — and also improve their studying abilities — a stone is put on a child’s belly, and they learn to focus on their breathing as the stone goes up and down. The technique can be taught to children as young as four, said Davidson. To foster kindness in teenagers, students are asked to visualize a loved one suffering followed by a thought that they be relieved of that suffering. This is extended to difficult people as well, said Davidson.